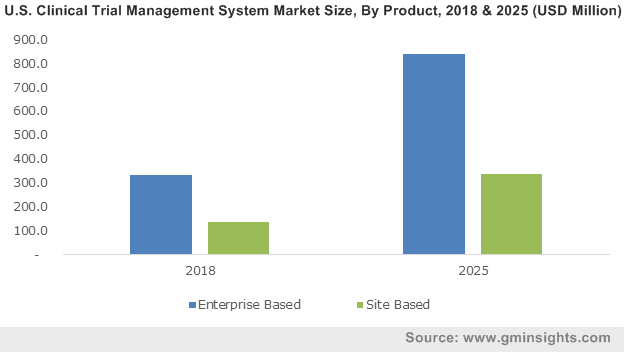 Clinical Trial Management System market size was valued at USD 1.1 billion in 2018 and is expected to witness 14.1% CAGR from 2019 to 2025. High prevalence of chronic diseases worldwide coupled with growing trend of outsourcing clinical trials will drive clinical trial management system market growth over the forecast period. Increased public and private funding in R&D activities will stimulate business growth. Furthermore, presence of stringent regulations for enforcement of clinical trial registration will surge the number of clinical trials being conducted thereby accelerating the global clinical trial management system industry growth. Growing demand for advanced IT-based clinical trial management solutions to improve managerial control in clinical trials will further boost demand over the coming years. Ability of the clinical trial management systems to manage complex protocol designs in clinical trials and reduction in timeline by streamlining processes will increase its adoption in the foreseeable future. Moreover, government efforts to invite multinational corporations for directing clinical trials to attract foreign reserves for financial and technological improvements will favor business growth. However, high costs involved in clinical studies may impede the industry growth over the analysis period. Services segment is anticipated to witness substantial CAGR of 14.6% by 2025 owing to large number of companies involved in outsourcing clinical studies thereby generating the need for services. Wide range of services offered by CROs along with surge in adoption of clinical trial management solutions should foster the business growth. 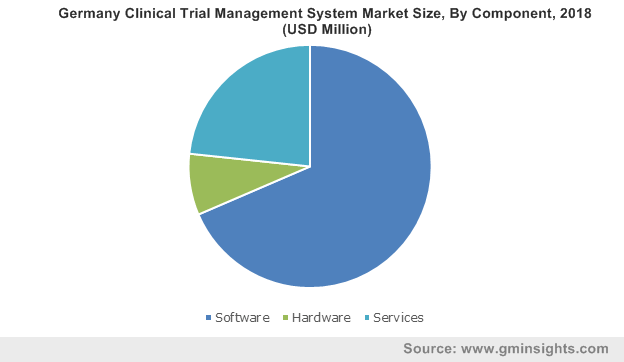 Software segment dominated the clinical trial management system market with the highest revenue share of 68.3% in 2018. Advancements in CTMS software to ensure effective management of clinical trials data generated by biotech and pharmaceutical companies will accelerate new product launch thereby escalating industry growth. Enterprise-based clinical trial management system was valued at 805.7 million in 2018 and will show a similar trend over the coming years. These systems enable faster access to subject data, patient recruitment, data capture, exchange and accelerate protocol design thereby resulting in increased adoption. Site-based clinical trial management system is projected to show robust CAGR of 14.0% during the forecast timeline. Site-based systems offering numerous solutions in clinical studies including services in financial management and visit management as well as protocol management will further spur the revenue size. Web-based clinical trial management systems held the largest revenue share of 60.5% in 2018 and is anticipated to show similar growth over the forecast period. Benefits offered by web-based CTMS systems including user-friendliness, high flexibility in function leading to cost-effectiveness and increased clinical trial efficiency will spur the segmental size. Cloud-based clinical trial management systems are estimated to witness 16.3% CAGR over the coming years owing to advantages offered by such as easy accessibility, real-time monitoring of clinical trial data and reduced costs. Pharmaceutical and biopharmaceutical companies accounted for 61.7% revenue share in 2018 and is expected to show lucrative growth in the future. The segment growth is attributable to increasing adoption of clinical trial management systems for clinical studies in the new drug development process. Clinical research organizations (CROs) segment was valued at USD 340.8 million in 2018. Increasing focus of pharmaceutical companies on outsourcing clinical trials will accelerate segmental growth. Investment in R&D by clinical research industries will further drive segmental growth. North America clinical trial management system market dominated the global market with 497.3 million revenue in 2018 and is expected to witness significant growth in the foreseeable future. Increasing number of clinical trials coupled with increasing funding for clinical research by NIH will drive business growth. Focus of companies on R&D activities on development of efficient products will surge the demand for clinical trial management system thereby augmenting regional growth. 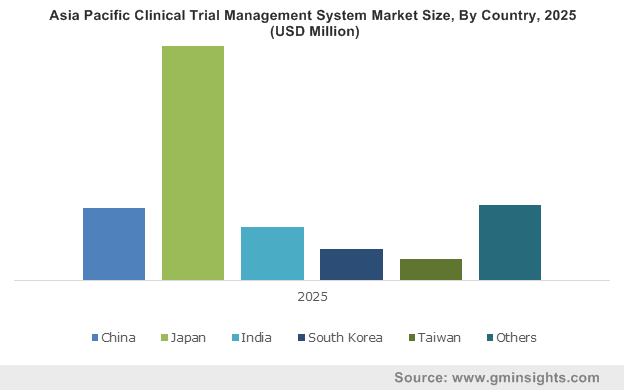 Asia Pacific clinical trial management system market is estimated to witness fastest CAGR of 14.5% over the forecast period. Increasing number of clinical trials being conducted in the region will favor industry growth. Outsourcing of clinical trials in countries such as China and India due to presence of diverse patient pool and low-operating cost of conducting clinical trials in these countries will further accelerate business growth. 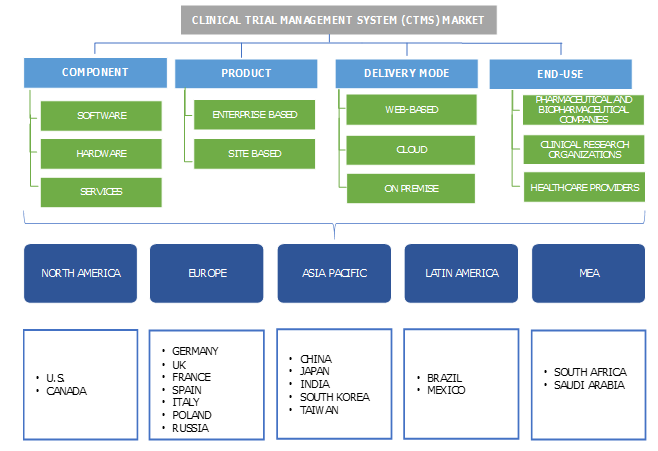 Some of the key industry players operational in the clinical trial management system market includes Bio Clinica, Medidata Solutions, DataTrak Internationals, Bio-Optronics, Merge Healthcare (IBM Watson), DSG, Forte Research Systems, MedNet Solutions, Omnicomm Systems, Oracle, MasterControl, Parexel Informatics and Veeva Systems. Industry players implement strategies including partnerships, mergers and acquisitions that assist them in maintaining their market position. For instance, in July 2016, Bio Clinica announced acquisition of Compass Research, a U.S. based clinical research network that has direct access to specific population with neurodegenerative disorder and other disorders. This strategy rendered company with sustainable profits and strengthened its market position. The need for eliminating data incongruities between systems to minimize data reconciliation activities and ensure accurate and up-to-date information for clinical trials led to development of clinical trial management systems. Individual solutions help to streamline certain application areas, however, maintaining several systems with overlapping data and functionality resulted in significant inefficiencies in clinical data. Number of data duplication and process redundancy has increased with the rise in number of relevant applications owing to greater adoption of electronic data capture (EDC) and other technologies. Development of an integrated technology suite to organize workflows as well as improve usability has increased the adoption of clinical trial management system over the recent years. Growing demand for these systems to enhance productivity and reduce need of human resource to input data will accelerate the clinical trial management system industry growth during the forecast period.